Welcome to Warm House Cozy Kitchen! I’m Margaret, and for the most part, I have no idea what I’m doing in the kitchen. Unlike most food bloggers, I did not grow up cooking or baking. My unbelievable mother was so busy raising my 6 younger siblings and me that she didn’t have time to prepare meals or baked goods (although she can make delicious queso and pralines – clearly Mexican food was a staple in our household). I’m now learning how to cook and bake, and I’m loving it! The main reason that I created this website and blog is too keep track of all of the recipes that I’ve tried and loved. I’m constantly coming across recipes in cookbooks, magazines, online blogs, etc., and I wanted to find a way to keep these recipe for myself and to share them with my family and friends! I’m trying to create a warm house and cozy kitchen for my family, and I think cooking delicious meals is one of the best ways to do this. In the fall and winter, decorating for the many different holidays is another way that I plan to keep our home cozy for this fun time of year! 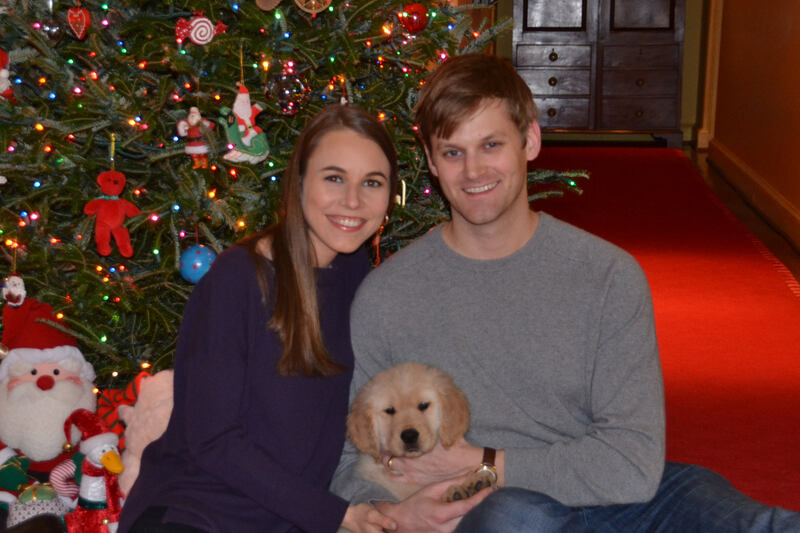 Here’s a picture of me with my husband, Warren, and our puppy, Gracie, back before our baby, Benjamin, was born. I’ll update this soon once we have a complete family photo!